Decades ago, I sat in my parent’s family room and watched a 16 mm black and white movie of their honeymoon in the Canadian Rockies. The mountainous snow capped region filled with shimmering lakes was enticing, but far removed from my suburban Chicago home. Each time my parents showed this footage, I secretly wished that sometime in the future I would venture to this spectacular place. Having only lived on flat land, I longed to explore rugged terrain. I eventually moved to Colorado so that I could have easy access to the Rocky Mountains. 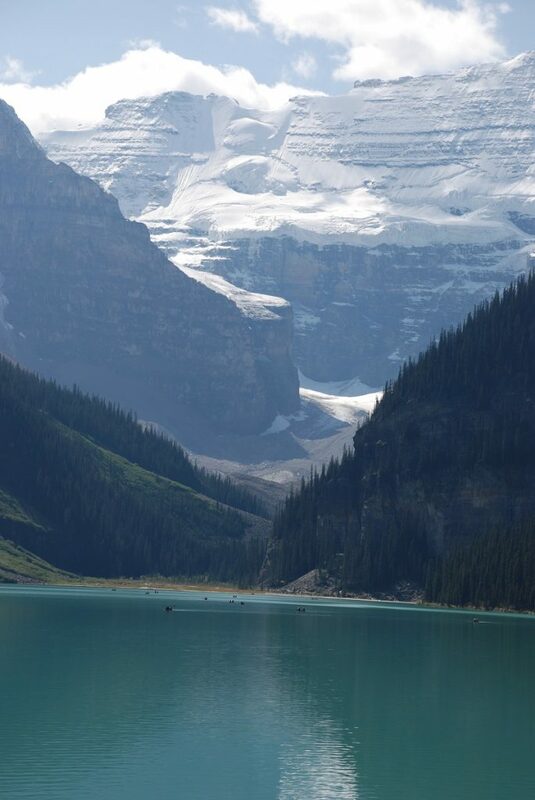 However, it took a few more decades before I fulfilled my childhood desire to explore Lake Louise and Banff. Unlike my parents who traveled in the 1940’s by train, I flew to Calgary and then drove to the resort area. Back then, my mother and father were fearful of plane crashes. Today, most people don’t think twice about airplane travel. With a fading memory, my elderly and frail mother cannot recall why they chose the Canadian Rockies for their honeymoon destination since neither put outdoor adventures at the top of their bucket list. Their first horseback ride together was to one of Lake Louise’s notable teahouses. While my mother has no recollection of the teahouse, she vividly recalls my father falling off his horse. Instead of riding, my husband and I chose to trek uphill to both the Lake Agnes and the Plain of Six Glaciers Teahouses. We were advised by the concierge at the Fairmont Banff Springs to arrive early since day parking at Lake Louise was limited. By 8:15 AM, the parking lot was almost filled. On our way to the trail, we passed a Swiss chalet built in 1920 for the trail guides, who in earlier years, were hired by hotel guests. The Canadian Pacific Railway built hiking and horse riding trails, shelters, and teahouses for visitors. Although the Swiss guide program was disbanded in 1954, the house remains. Swarms of people congregated alongside Lake Louise’s pristine shoreline that stood adjacent to the Fairmont Chateau Lake Louise. 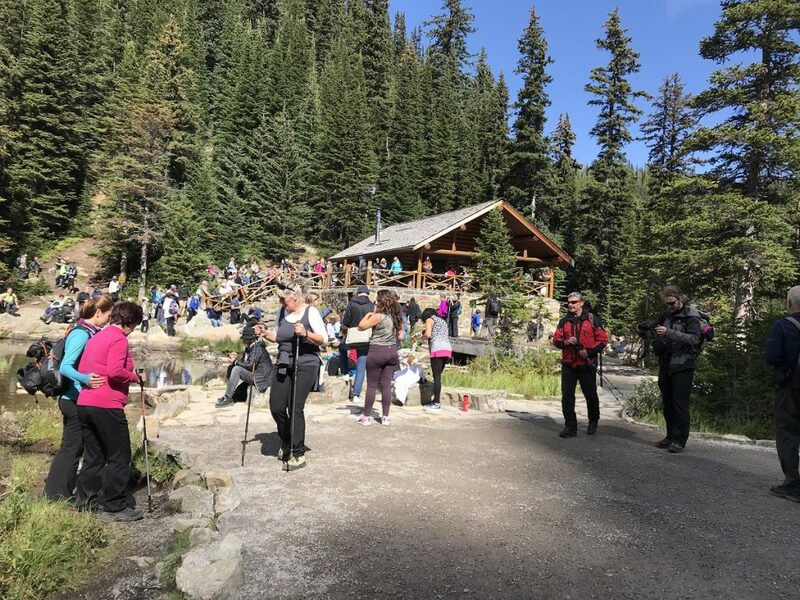 Most people were posing in small groups before the sparkling aquamarine lake and the snowcapped and icy mountain ranges in this subalpine zone, below the treeless alpine slopes. A potpourri of nationalities was part of the mix evidenced by the fact that English was not the dominant language. The black and white images from my youth didn’t compare to the majesty that I was now witnessing as an adult. The natural landscape was a stunning example of Mother Nature’s paintbrush. My husband and I joined countless others snapping images on both our cameras and cell phones. What a wonderful tribute to Queen Victoria’s fourth daughter, Princess Louise Carolina Alberta. This location became part of Canada’s first national park in 1902. 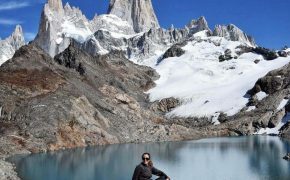 We began our journey on the Lakeshore Walk that was filled with a multitude of people of varying abilities who were dealing with an altitude of 1,731 meters or a little more than a mile above sea level. A posted map indicated that this flat trail is about two kilometers, or about a mile and a quarter, each way. 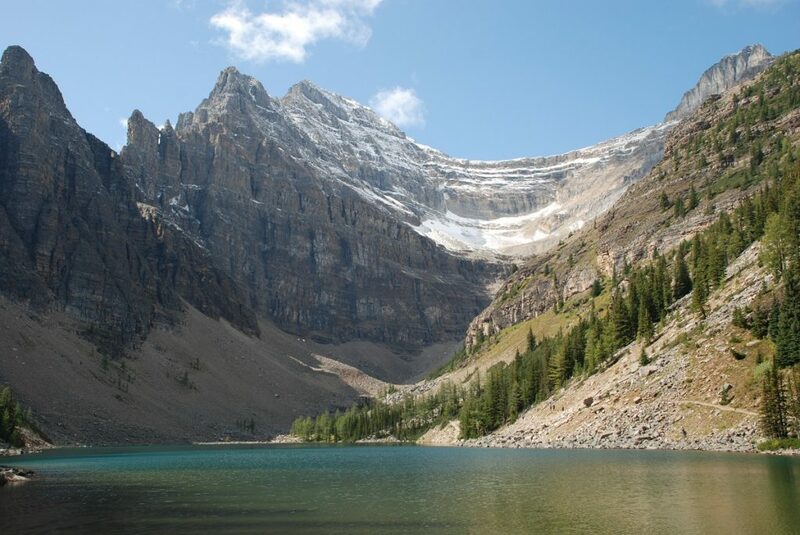 From this path, hikers can either take the Lake Agnes Trail or the Plain of Six Glaciers Trail. Both lead to teahouses that are open from June to early October. With long, cold winters, the summers are short and brisk. In 1890, Lake Agnes was named for two noteworthy women, Agnes Know, the first white woman to visit this lake and Susan Agnes Macdonald, the wife of Canada’s first Prime Minister. 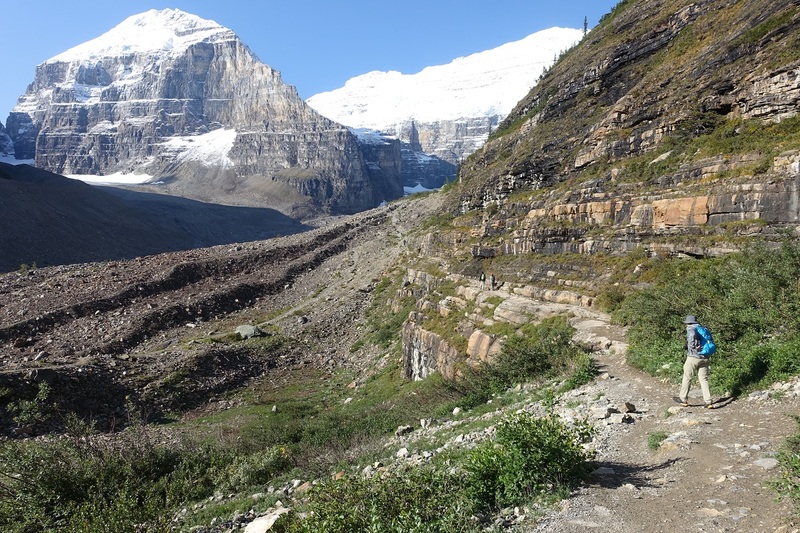 Since the Plain of Six Glaciers Trail took us deeper into the valley and offered closer views of the Upper and Lower Victoria Glacier, we opted to take this route. To reach the trail head, we followed the Lakeshore Walk that hugged the shoreline until we reached a marker. The cool, damp morning air was laden with a lingering scent from the mature fir and spruce trees. 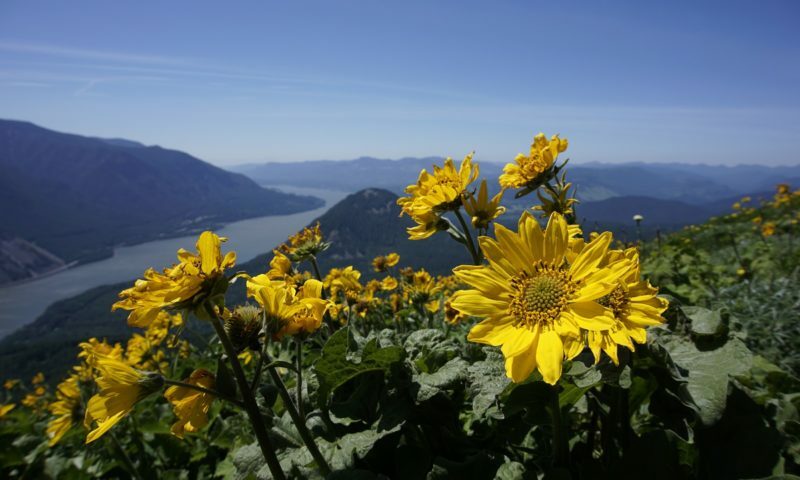 Occasionally, a splash of color from a bunch of wildflowers or small waterfalls emerged from the greenery and rocky landscape. When the Nordic trail ended, we traversed over a wetland by using a wooden plank boardwalk that led to the next segment of the trail. As we looked back we could see Chateau Lake Louise in the shadows of steep mountain ranges carved with ski slopes. As the trail became rocky with an upward pitch, the number of hikers dwindled and we had some welcomed space. Our view of the glacier and its steep rocky base became clearer and clearer. Alongside the path we saw layers and layers of rock and greenery. At one point, we walked along a narrow canyon trail that had slippery spots from melting snow. Switchbacks helped alleviate the stress of trekking upward. Clouds periodically covered the nearby icy peaks. 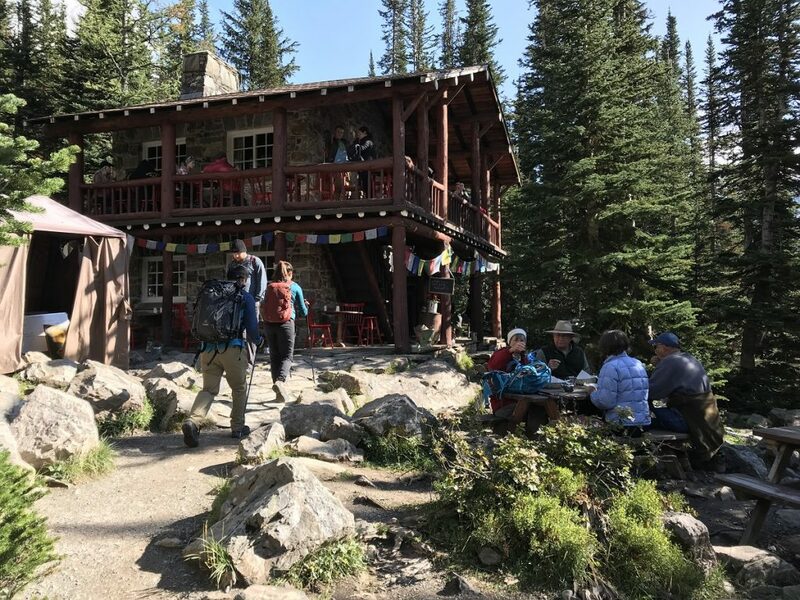 After approximately 5.5 kilometer or 3.5 miles with an accompanying elevation gain of 335 meters or 1,100 feet, we reached the two-story teahouse that was built by the Canadian Pacific Railway in 1927. The people who daily prepare and serve the freshly made food stay on site for five days without any electricity. All of their cooking is done on propane stoves. One of the kitchen staff shared that they prepare 600-800 meals a day in the summer and 400-500 meals near the end of the season in September. 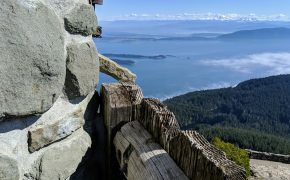 The non-perishable supplies are flown in by helicopter at the beginning of the season and additional items are brought on horses, or by the staff that hikes the same trail as the visitors. In 1959, Joy Kimball purchased the teahouse and raised her two daughters at this location. Today, one of her daughters continues the family tradition. Most of the seats on both levels of the teahouse were occupied and several people were waiting in line to place their order from a menu that had a handful of meal options. Instead of waiting, we ate our own snack and hydrated with water. 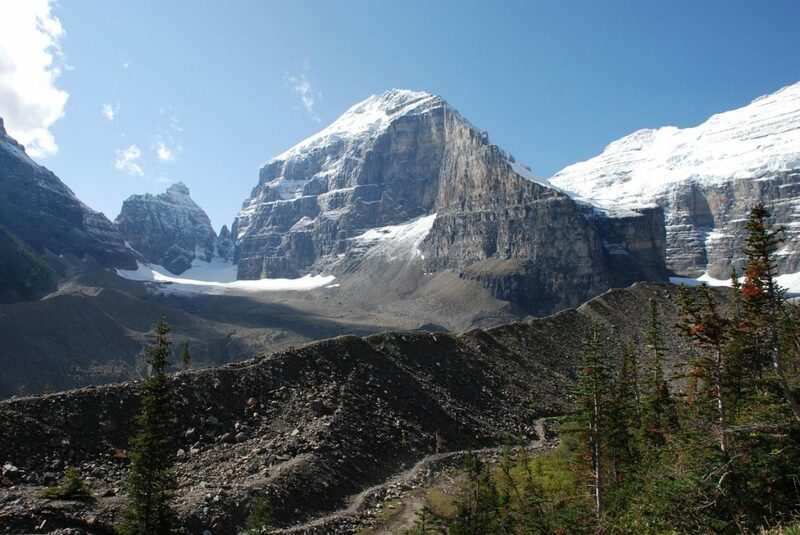 We opted not to climb an additional 1.4 kilometers to the Plain of Six Glaciers Lookout or Abbot Pass View Lookout. Abbot Pass was named after the first climbing fatality in the Canadian Rockies, Philip Abbot. If we were experienced climbers, we might have considered trekking further to the dangerous narrow chute that is prone to avalanches. 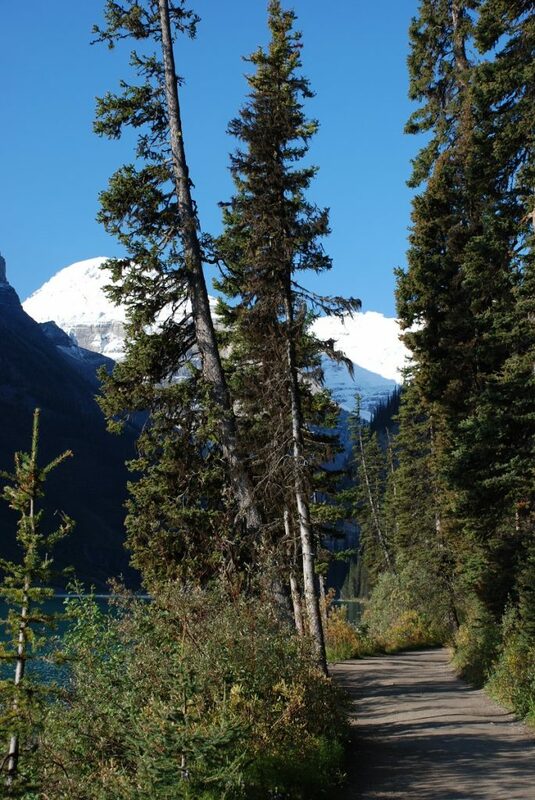 This trail leads to the Abbot Pass Refuge Cabin, Canada’s highest National Historic Site. Instead we admired Victoria Glacier and Lafroy Glacier and soaked in the sunshine that was removing the early morning chill. A posted sign had black and white photographs from the early part of the 20th century. This graphic highlights the amount of melting that has occurred over the last century. We retraced our steps until we saw a cut off for the Lake Agnes Trail. We could either continue heading down the way we had come or take a detour up toward Lake Agnes, which was approximately four miles away. We trekked to Lake Agnes. 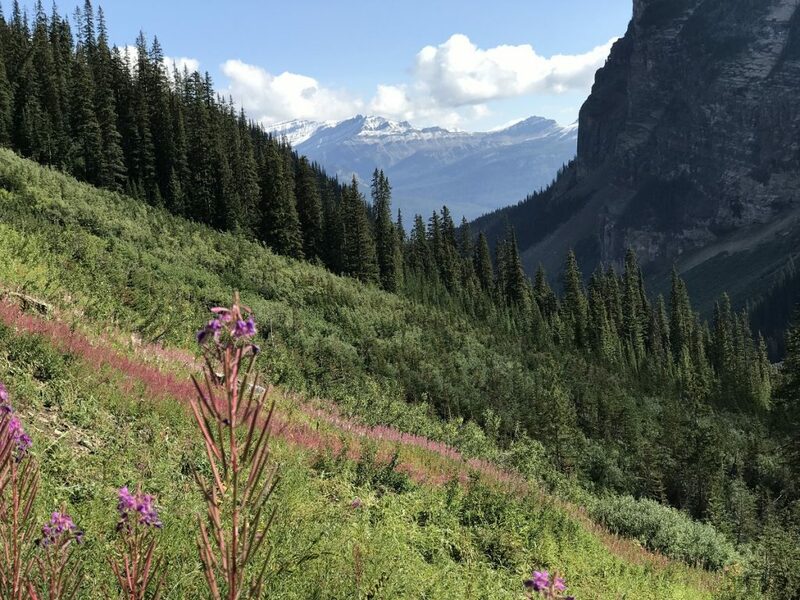 This path, laced with tree roots and littered with rocks, headed away from Lake Louise and included deeply forested stretches and open meadows. Every now and then we could get an elevated glimpse of the lake and its spectacular background. Wildflowers and wild berries continued to offer contrast to the green vegetation. The shaded areas provided relief from the bright sunshine that was continuing to warm the air. It was close to lunchtime when we arrived at the Lake Agnes Teahouse. Both the nearby outhouse and the restaurant had extremely long lines. The current structure was built in 1981 to reflect the style of the teahouses that had previously stood at this location. Once again, we chose to nibble on healthy snacks. We didn’t have any Canadian dollars and were told that the teahouses usually didn’t accept credit cards. Our goal was to visit Mirror Lake, Lake Agnes, and also walk down the wooden staircase to the small waterfall that was near the backside of the teahouse. At each site, we paused and took time to appreciate our location. Had we known that Mirror Lake resembled a tiny pond, we would have skipped this small diversion. It was challenging to take photos without people blocking our view. Even though signage indicated that grizzly bears, mountain goats, wolverines and lynx roamed freely in the area, we only encountered a handful of squirrels, chipmunks, and flying gray jays. Perhaps, the abundance of people on the trails kept the wildlife away. By mid afternoon, our Lake Louise Teahouse adventure had come to an end. At the parking lot, our phones’ walking apps had logged over 14 miles. I had finally come to the place that I had longed to see from my youth. Lake Louise’s spectacular beauty was considerably more vibrant in color and in person. While I’ll never know what caused my parents to choose this place for their honeymoon, I’m grateful that their rare footage from their 1947 honeymoon introduced me to a life of adventure. When Sandy Bornstein isn’t trekking in Colorado or writing, she’s traveling with her husband Ira. After living as an international teacher in Bangalore, India, Sandy published an award-winning book, May This Be the Best Year of Your Life, as a resource for people contemplating an expat lifestyle and living outside their comfort zone. Among other things, Sandy writes about family, intergenerational, and active midlife adventures highlighting land and water experiences. All photos by The Traveling Bornsteins.